The sun sets over the plains of Vizcaíno Desert, Baja California península, Mexico; a vast desert watered by fog from the Pacific Ocean. A group of peninsular pronghorn antelope (Antilocapra americana peninsularis) stretch and lay about in the cool afternoon, and a few, spooked by a rustle in the bushes, dash by at speeds of over 80 kph. The fastest land animals in the Americas, adult pronghorns (A. americana) can easily outrun any potential modern-day predators, such as coyotes or grey wolves. Their physiology hasn’t changed significantly in the past 10,000 years, and their vestigial speed is a remainder of the deep past millions of years ago, when they outran Protocyon – a Pleistocene pack-hunting canine – and American cheetahs (Miracinonyx sp.). Today, the pronghorn is a survivor from a distant world, when huge extensions of North America were vast savannas populated by lions, cheetahs, and antelopes. Several million years ago, several genera of Antilocapridae dashed across the North American grasslands with other ungulates like horses, tapirs, peccaries, camels, muskoxen, and several species of bison. Their predators were equally diverse and some quite formidable. American cheetahs, large, swift felines, preyed on the ungulates of the North American grasslands and pronghorns may have been among their preferred delicacies. It’s thought that the pronghorn’s exceptional speed is the result of predation by Miracinonyx: their top speed near 100 kph are much more than capable of outrunning extant predators like coyotes, grey wolves or cougars. American cheetahs were likely the principal agents of selection that prompted the evolution of the pronghorn’s extraordinary running speed. Cheetahs were far from the only twilight beasts that threatened ancient pronghorns: Protocyon and hyenas (Chasmaporthetes ossifragus) may have pursued adult pronghorns in chases like those now carried out on gazelles by African wild dogs. The giant short-faced bear (Arctodus spp. ), possibly the largest carnivorous land animal to have lived in North America, may have ambushed or stalked pronghorns. Saber-toothed cats (genera Megantereon, Smilodon, and Homotherium) were adapted to hunting large, slow, prey, but pronghorns may have been taken occasionally. The dire wolf (Canis dirus), a large Wolf with powerful jaws, was probably a slow scavenger, but may have posed a threat to fawns or weak adults. Canis lepophagus, a Pleistocene ancestor of the coyote, was likely a major predator of pronghorn fawns, much as coyotes are today. By around 12,000 years BP, there was an additional predator in North America. Homo sapiens had arrived from Beringia. The world has changed radically in the last 5000 years: sea levels have risen, much of North America has become hotter and drier, and the giant mammals of the Ice Age are mostly long gone. Pronghorns, however, are one of the few survivors of another world, where cheetahs and mammoths roamed what is now northern Mexico. Hunter-gatherers, such as the creators of the Comondú archaeological complex (probably ancestors of the Cochimí people), were well established in the deserts and coasts of Baja California. 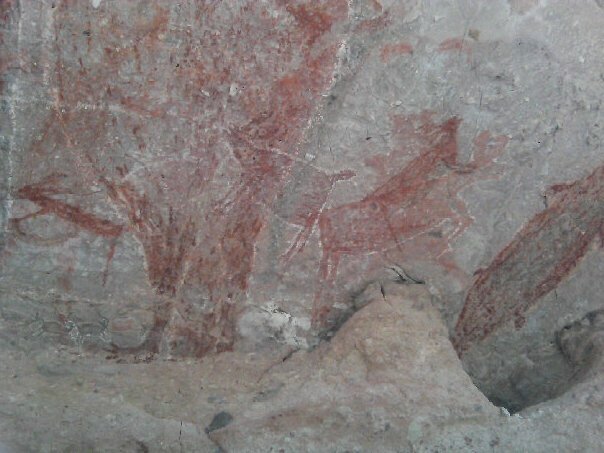 They left few material remains, but the Comondú artists left behind a prolific number of cave paintings, dating from around 7,500 B.P. until around 600 years ago; they make up the oldest rock art tradition in the Americas, which lasted for millennia. Murals several metres high show humans, anthropomorphic figures, sea animals and desert fauna such as pronghorns, mule deer (Odocoileus hemionus), and bighorn sheep (Ovis canadensis). Although their meaning is obscure, some archaeologists suggest that they had ritual purposes linked to ancestor worship or hunting magic, perhaps as life became more difficult due to overhunting or the general desiccation of western North America. Pronghorns, along with other large mammals and anthropomorphic figures, appear in several murals in the Sierra de San Francisco, Baja California Sur, Mexico. A few thousand years have passed since the Baja Californian artists painted the Great Murals of the Central Desert. The Spanish came, native people died in huge numbers in plagues and famines, empires fell and countries were born. During the tempestuous nineteenth and twentieth centuries, whalers, miners, sailors and vaqueros traversed the Baja Californian deserts. By the early twentieth century, pronghorn populations in northern Mexico had been diminished by hunting and habitat fragmentation due to cattle ranching. Pronghorns in the United States faced similar threats, and were hunted out of most of California by the 1940s. Today, pronghorns are abundant in much of western North America from the southern Prairie Provinces of Canada south through the western U.S. to northern Mexico. However, certain subspecies such as the endemic Baja California pronghorn (A. americana peninsularis) are critically endangered. Today, the Baja California pronghorn inhabits a much smaller range than in the past, due to poaching (hunting pronghorns is banned by Mexican law since 1922) and habitat fragmentation. Predation of fawns by coyotes is another major problem; according to a conservation worker, “Where people go, they take trash, and where there’s trash there are coyotes”. As human activity expands across the Vizcaíno desert, threats to pronghorn populations can increase directly and indirectly. Aerial surveys indicate that there are less than 100 Baja California pronghorns in the wild, mostly within the Vizcaíno Biosphere Reserve –a UNESCO World Heritage Site– and the Valle de los Cirios Protected Area. 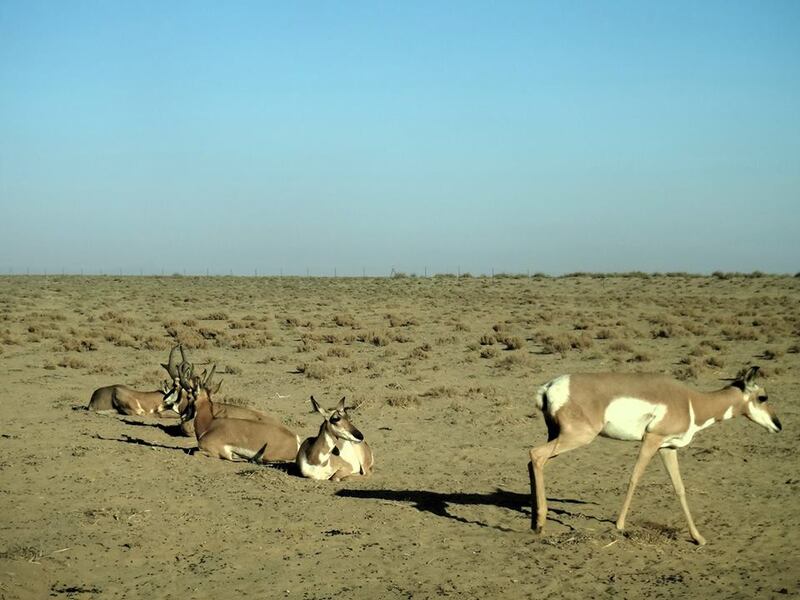 Fortunately, the Mexican National Park Comission (CONANP) is actively breeding Baja California pronghorns in captivity, with over 400 individuals located in three reserves over 56,000 hectares of the Central Desert. As efforts continue, Baja California pronghorns may be reintroduced into the wild, and continue being a connection with the distant world of the Pleistocene. This entry was posted in Pronghorn and tagged American cheetahs, Antilocapra americana, Antilocapra americana peninsularis, Baja California peninsula, Bighorn sheep, Bison, camel, Canis dirus, Canis lepophagus, Chasmaporthetes ossifragus, Comondú archaeological complex, Cougar, Coyote, Dire Wolf, Grey wolf, Homotherium, Horse, Megantereon, Miracinonyx sp., Mule deer, Muskoxen, Odocoileus hemionus, Ovis canadensis, Peccary, Pronghorn Antelope, Protocyon, Short-faced Bear, Sierra de San Francisco, Smilodon, Tapir, Vizcaíno Biosphere Reserve, Vizcaino Desert. Bookmark the permalink. I always did wonder why Pronghorns were so dang fast. I’ve seen them bolt like a gazelle across an open prairie. It’s odd to think that Pleistocene North America was a lot like Africa, what with the lions, cheetahs, hunting dogs and proboscideans.